Way back in November of 2017, the NHL made a simple announcement that sent the hockey world buzzing. The 2019 Winter Classic game would pit the Chicago Blackhawks against the Boston Bruins in the first-ever non-football contest to be played in Notre Dame Stadium. While nearly every fan in at least a four state radius - along with Massachusetts - was frantically hunting for ticket information, Irish Youth Hockey League Brian Troester began hatching a bigger plan. "As soon as they made the announcement that the game would be played in South Bend, I thought 'how can we use this to benefit the kids?'" Troester immediately reached out to Mike McNeill, the Operations Manager at Notre Dame's Compton Family Ice Center, to see what could be done. "Mike really was the guy to pull things together. With his help, and through the cooperation of the NHL, we were able to secure about nine hours of ice time." 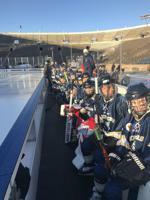 In the days following the Winter Classic, after the 76,000 fans had gone home and prep for the NCAA tilt between the Irish and the Michigan Wolverines was under way, the stadium rang with echoes of a different sort: local youth players engaged in the game they love on the very same ice that their heroes skated on just days before. With some careful planning, nearly every team in the organization had an opportunity to play hockey or at least skate on the majestic sheet. "Most of our 10U, 12U, and 14U teams had the chance to play scrimmages games amongst themselves, and we were able to offer our House league players from 6U to 14U the opportunity to skate on the ice," said Troester. But it was the girls who stole the show, as the 12U Shamrocks team hosted the Indy Fusion 12U in the only legitimate contest to be played on the ice ... aside from the NHL and NCAA games, of course. Fittingly, the game ended in a 4-4 tie, spoiling nothing about this incredible experience for either team. If Troester had his way, "every kid in the state would get a chance to skate on this ice. Unfortunately, there was a very limited number of hours available. We got as many of our kids out as we could." The NHL also provided 150 tickets to the IYHL for their coaches to attend the game, and members of the St. Joseph High School team presented the flag for the national anthem at the game. While it was all the NHL's doing to put the Winter Classic in northern Indiana, giving the youngsters a chance to skate on the ice was simply another in a long list of steps Troester has taken to help grow the game. Even with over 500 players and 70+ coaches in the organization, Troester, the IYHL Board, and countless volunteers go to great lengths to make sure every kid and coach has a great hockey experience. No worries there, Brian. We're pretty sure they did.